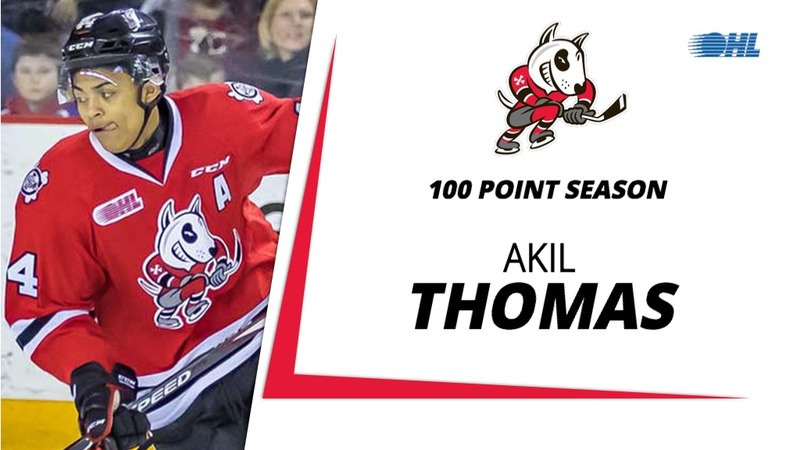 Niagara IceDogs forward Akil Thomas joined teammate Ben Jones in reaching the 100-point plateau on Saturday as the Dogs defeated the Barrie Colts 7-4 on the road. Thomas picked up an assist in the win, giving him points in five straight contests for a total of 37 goals, 63 assists and 100 points over 62 games this season. The third-year forward from Brandon, Fla. has recorded an impressive 239 points (80-149–239) over 191 career regular season games since being Niagara’s first round (12th overall) pick in the 2016 OHL Priority Selection. The Los Angeles Kings selected Thomas in the second round of the 2018 NHL Draft. Thomas joins teammate Jones in becoming the fifth player in Niagara IceDogs history to reach triple digits in a full season with the team, following in the footsteps of Ryan Strome (2010-11), Luca Caputi (2007-08) and Michael Swift (2007-08). Thomas, Jones and OHL scoring leader Jason Robertson are among nine different OHL players with at least 100 points on the 2018-19 season. The IceDogs are the first team since the 2016 Memorial Cup champion London Knights to have three different 100-point scorers in their lineup.